A few months ago an opportunity arose where we considered shifting back to the UK for a period of time for work. A decision one way or the other had to be made within about 24hrs as an American company was interviewing in London almost immediately. Within such a short space of time my world was turned upside down (literally) considering all aspects, what to take, what to leave in storage, accommodation, pets, family etc. etc. I even took a long hard look at all my cookbooks, thinking that if I were to pack anything what would it be. 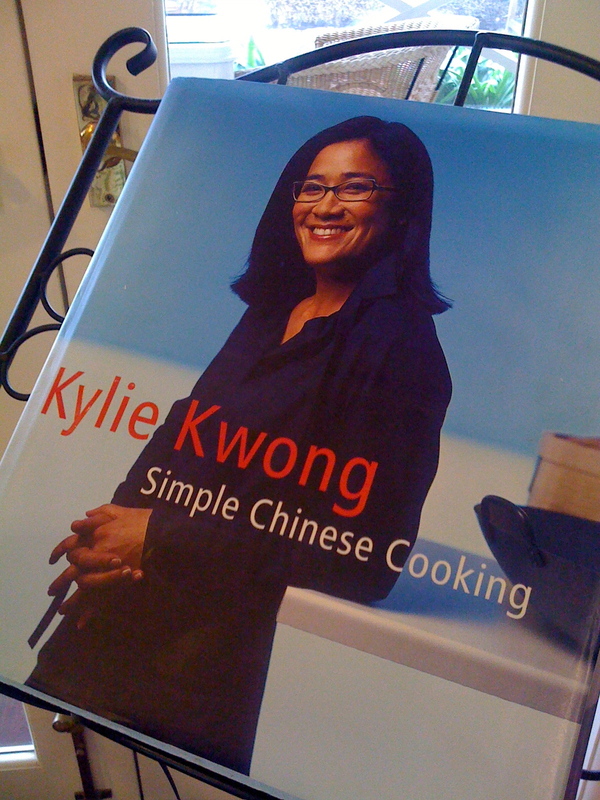 Without hesitation I made an instinctive decision on a book I really couldn't do without, Kylie Kwong's Simple Chinese Cooking. We cook from this book at least once a week, and I always need it cos I can't remember the measured ingredients to hardly any of the dishes off by heart. Not that they are difficult but I just haven't mastered the little intricate ingredients that just make the flavours work so wonderfully together. I think I can get by cooking most things by instinct but somehow Chinese dishes just elude me. Hence if I had to grab a book and run this would be the one. This recipe serves 4 with steamed rice. 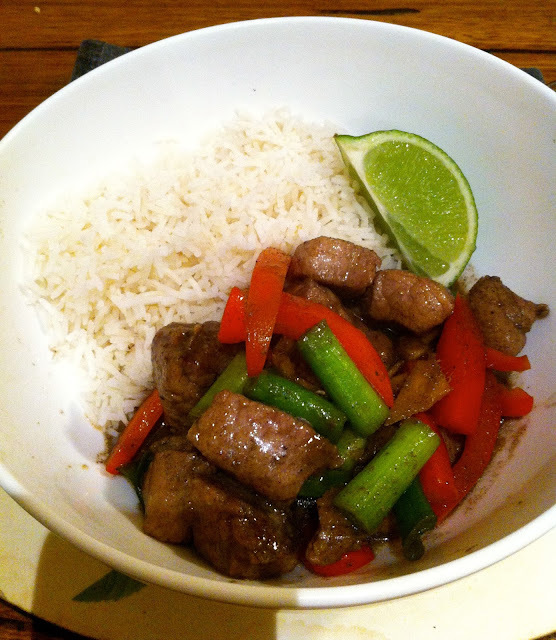 If possible marinate the pork overnight for a better flavour. Something I never seem to remember. Combine pork with marinade ingredients in a large bowl, cover and leave to marinate in the refrigerator for 30 minutes or overnight. 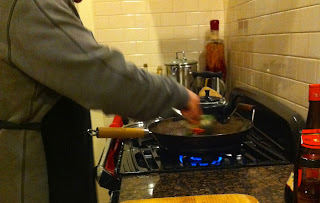 Remove from the wok with a slotted spoon and set aside. 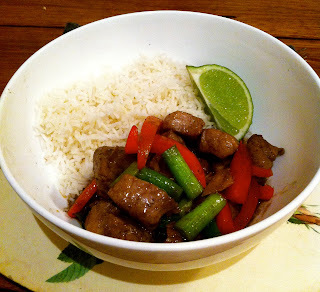 Return reserved pork to the wok with spring onions, vinegar, soy sauce and water. 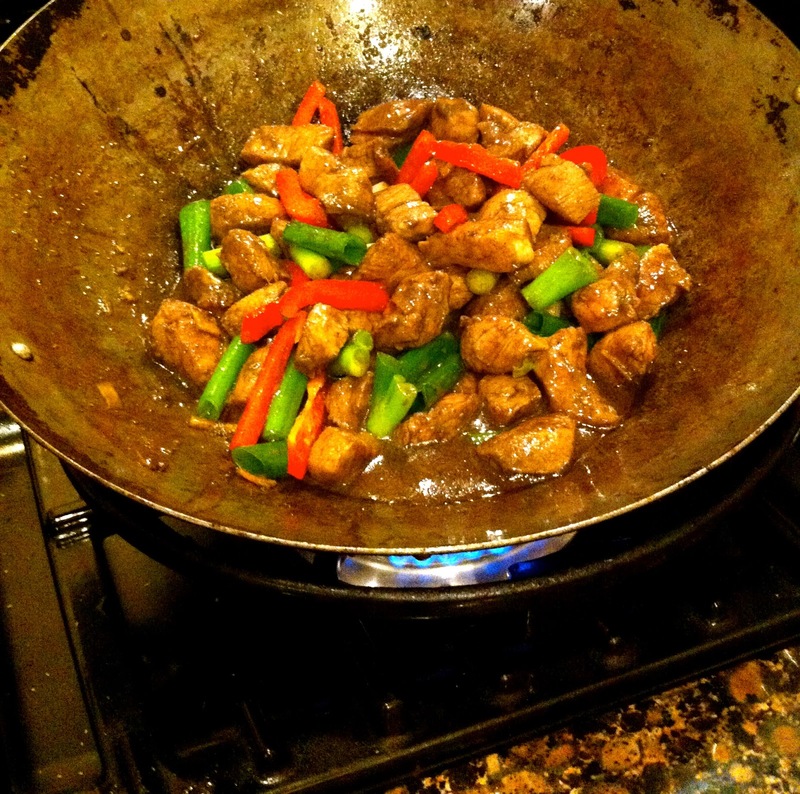 Throw in the capsicum and fry for another minute or until pork is just cooked through and lightly browned. Serve with steamed rice with limes on the side ready for spritzing over the pork! We decided the timing was not right for us to up stumps and leave, so my cook book collection is still loved and safe for the time being but this book of Kylie's is perfect to join with Belleau Kitchen Random Recipe Challenge "grab and run"for August. 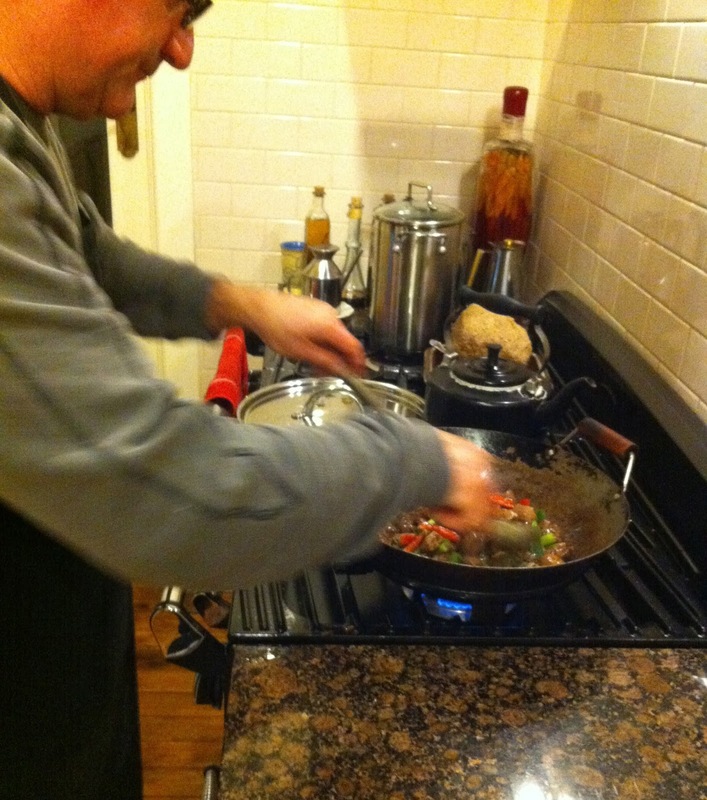 I love love LOVE a great stir fry. Honey and ginger are two of my favorite ingredients too! Think I am addicted to the combo of honey and ginger. it's so true about confidence with measurements, particularly if you're unsure of certain flavours like Chinese, I too would always defer to the cookbook... this looks like a great book and clearly a very tasty and simple stir fry, perfection! it must be a scary prospect thinking about leaving for another country!... Thanks for the excellent entry! When we bought this book I was very happy to note that all the ingredients used in the recipes are listed and described in the first few pages. We bought them all so that when we wanted to cook something we had everything to hand. We have a separate shelf in the pantry dedicated to chinese ingredients . Glad I squeezed into this months challenge. Thanks for the introduction to a cookery writer new to me. What a great recommendation - the book you would choose to grab and run. 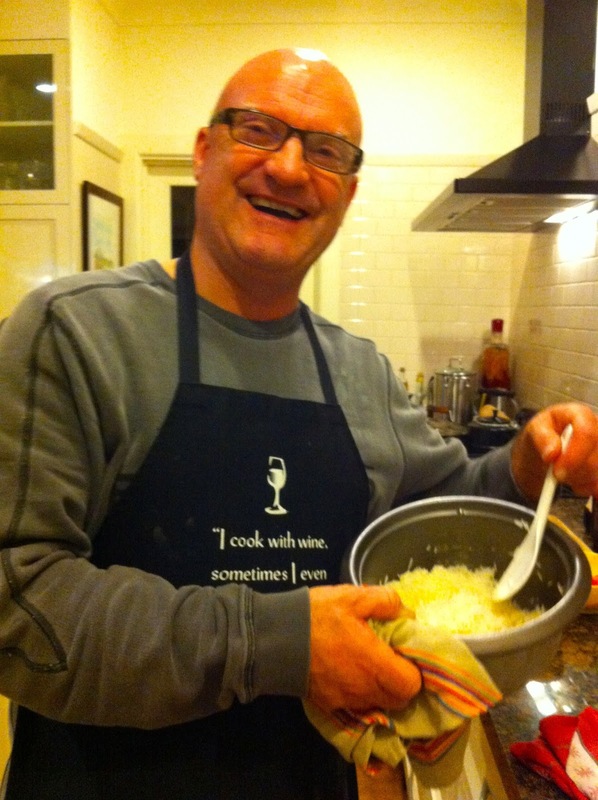 This is an excellent recipe for a quick tasty meal any time of the week. Its a really nice book - true to its name. I don't eat red meat but this looks scrumptuos and I'm sure the rest of the family would. 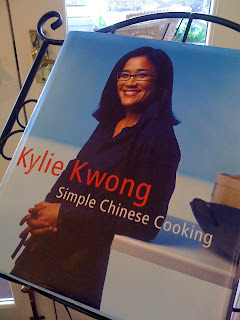 I hadn't heard of Kylie Kwong...but always love any cooking that's simple. Thanks for sharing. Kylie is one of our celebrity chefs she has had her own cooking show and has a restaurant in Sydney. Love her flavours, maybe you could substitute the pork? We considered it seriously but there were too many complications that didn't make it the right time, but who knows what the future will hold. 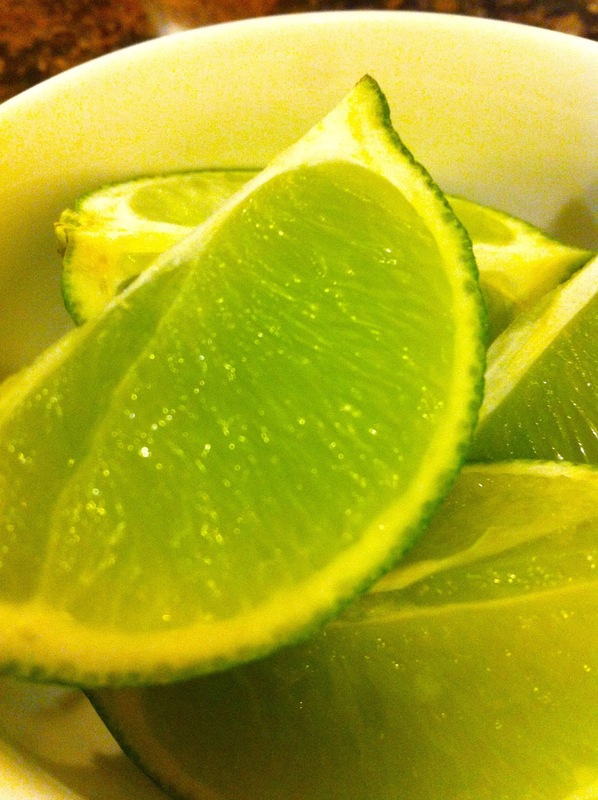 Yum is right as you would know. You certainly can and thank you. Its a small world - shame you can't get Kylie's books over there - she is quite a nice TV cook too. Next time we are in Sydney we intend to go to her restaurant. When we moved that was one of the books I brought with me - along with The Cook's Companion and Delia's Complete Cookery Course. All bases covered there I think! I have this recipe bookmarked but I haven't gotten around to doing it yet so thank you for the inspiration. Roasted Corn on the Cob - so simple!